The Old Testament declares in many places that Jesus Christ will never be killed, nor be crucified. Please visit: http://www.answering-christianity.com/isaiah_53.htm for ample references and details. Isaiah 53, Psalm 91 and Psalm 116, 117 and 118 have ample claims that Christ will never be harmed or killed. "Then Jesus, calling out with a loud voice, said, â€œFather, into your hands I commit my spirit!â€ And having said this he breathed his last"
5 Into your hand I commit my spirit; you have redeemed me, O LORD, faithful God. 7 I will rejoice and be glad in your steadfast love, because you have seen my affliction;you have known the distress of my soul, 8 and you have not delivered me into the hand of the enemy; you have set my feet in a broad place. 9 Be gracious to me, O LORD, for I am in distress; 13 For I hear the whispering of manyâ€” terror on every side 15 My times are in your hand; rescue me from the hand of my enemies and from my persecutors! 22 I had said in my alarm, â€œI am cut off from your sight.â€ But you HEARD the voice of my pleas for mercy when I CRIED to you for HELP. 1st : we are Muslims and don't believe that Jesus was crucified,isn't it? If so , I think no sense to use words that are claimed to be uttered by Jesus while he was crucified ,to make a point negating Jesus crucifixion. 2nd: The language in psalms ,is not a language of predictions if read carefully objectively ,it simply conveys the message of David that was assured that the Lord would preserve his life in the face of death. He rejoiced because God enabled his body to rest securely even when confronted with death. I think cutting any psalmist passage out of context ,to make a prophecy, means that anyone can accommodate the psalm to contemporary fancies ! we blame(rightly) the christians for taking some passages out of context from the psalms applying it to Jesus,claiming they predicted his crucifixion. yet we do the same exact thing when we take some passages out of context from the psalms applying it to Jesus,claiming they predicted him not killed,nor crucified.! 3rd: Even,for the sake of argument, we ignore what a valid language of a prophecy should be,assuming the passages quoted as a prediction of crucifixion ,or a protection from death to be used as prophecies, still remains the problem of exclusiveness !!! in other words how do you know that such (so called) prophecies are applied to Jesus and not anyone else ? how many righteous been exposed to dangers and some been executed and others were saved? their experiences are all valid as a fulfillment to such prophecy ,isn't it?! Brother Final Overture wrote: We know from Qur'an that Jesus is the Messiah. As a title (that lots of others before him had), or as the messiah that is predicted in the old testament? if you believe the second ,then I need elaboration with authentic textual support for that ,plz.? Thank you for your patience reading ...May Allah bless you always. About the first: Jesus said that before he was crucified, when he was pierced. Crucified = died. He was just peirced as written in the Psalms. Yeah, Psalms 22 even deals with this "
how many righteous been exposed to dangers and some been executed and others were saved?" Surely, Psalms 22 tell us that Jesus won't die. The debate is located at: http://www.answering-christianity.com/was_jesus_crucified_debate_between_dr_zakir_naik_and_pastor_rukni.wmv. This is yet another wonderful 3-hour debate and video by Dr. Zakir Naik where he thoroughly demonstrated from the Bible's New Testament that Jesus Christ was never crucified, nor did he ever rise from the dead. in other words how do you know that such (so called) prophecies are applied to Jesus and not anyone else ? Jesus himself quoted it, so why not? About the first: Jesus said that before he was crucified, when he was pierced. Crucified = died..
1- Do you believe as a Muslim,that Jesus was put on the cross? 2- What do you mean by "Crucified = died" ? 1- Do you trust the writers of the new testament putting passages in the mouth of Jesus ,making him claiming that the old testament made predictions fulfilled in his mission? If you do trust them ,I don't. you ask why? eg: Do you believe the writer of Luke (whom you just quoted) when he said,that Jesus said not only he will be resurrected after 3 days ,but also such resurrection is predicted in the old testament ? Do you believe the writer of Mark when he said that Jesus said ,that the execution of John the baptist was predicted in the old testament ? But I (Jesus) say unto you, That Elias is indeed come, and they have done unto him whatsoever they listed, as it is written of him. the fact that nowhere in the old testament it is written that the messiah will be resurrected from the dead after 3 days,neither a prediction of John the baptist as being executed.!! 1- There is no proof that the reference in Psalm 22:16 to pierced hands and feet was a prophecy of the crucifixion of Jesus. Contextually, there is nothing in this psalm to indicate that the writer intended the statement to be so understood. An objective reading of the psalm should be enough for any reasonable person to see that the writer was referring to himself and certain abuses that he was suffering at the hands of his enemies. "Many bulls have surrounded Me," the psalmist said in verses 12 and 13. "Strong bulls of Bashan have encircled Me. They gape at Me with their mouths, like a raging and roaring lion." Was this some kind of prophecy of the suffering that Jesus would endure or was it a reference to some personal abuse that the psalmist felt he was experiencing in his present condition? Not even the overly imaginative mind of the writer of Matthew in his endless quest for prophecy fulfillments tried to relate this statement to the life of Jesus, yet the gospel writers took the reference to pierced hands and feet just three verses later and exclaimed, "Aha, prophecy fulfillment!" What is the rationale for distorting the scriptures so flagrantly? Well, the answer, of course, is obvious: the gospel writers were desperate to prove that their man Jesus was the Messiah who had been promised in the Old Testament. Since there really were no prophecies of a virgin-born, crucified, resurrected Messiah in the Old Testament, they had to twist and distort to give the appearance that Jesus was the long-awaited one. Absurdity in the claim that the reference to pierced hands and feet in this psalm was a prophecy about Jesus becomes even more evident when the obscurity of the statement is considered. A footnote in many reference Bibles will point out that use of the word *pierce* in Psalm 22:16 follows the Septuagint, Syriac, and Vulgate versions but that the original word is pointed in the Hebrew Masoretic text to read *lion*, and despite the loss of an important prophecy-fulfillment text some English translations recognize the uncertainty of the text. The REB and NEB, for example, render the statement like this: "Hounds are all about me; a band of ruffians rings me round, and they have bound me hand and foot." The GNB says, "A gang of evil men is around me; like a pack of dogs they close in on me; they tear at my hands and feet." This translation has a footnote to point out that the last statement in the Hebrew reads, "Like a lion, they tear at my hands and feet." Some reference Bibles also have footnotes to indicate that the latter statement may mean, "They tie my hands and feet," as the REB and NEB actually translate it. The point is that the original text is very uncertain in its meaning, and on the basis of the Septuagint translation of a controversial word, the gospel writers have twisted this statement into a prophecy of the crucifixion of Jesus. What Dr. Ross is actually claiming, then, is that the odds are 1 in 10^13 that a controversial, uncertain text in a psalm about the writer's personal suffering was a prophecy of the crucifixion of Jesus. It is just such nonsense as this that biblicists must resort to in their desperate search for something--*anything*--to support their irrational belief that the Bible is the "inspired word of God." Then there is that strange plea to be saved from the sword! Deliver me from the sword . . . (Psalms 22:20)Always worth remembering to ask God to deliver you from a sword when he lets you experience the niggling inconvenience of being crucified. -Then there is that strange plea to be saved from the sword! Deliver me from the sword . . . (Psalms 22:20)Always worth remembering to ask God to deliver you from a sword when he lets you experience the niggling inconvenience of being crucified. 2- So is this proof that prophecy was fulfilled when the hands of Jesus were pierced during his crucifixion and when lots were cast for his garments? Not at all! To so argue is again to assume the historical accuracy of the New Testament documents. There are absolutely no contemporary non biblical records of the crucifixion of Jesus, so to accept as absolute fact everything reported in the gospels, which flagrantly admit that they were written for propaganda purposes to further the belief that Jesus was the son of God. how many righteous been exposed to dangers and some been executed and others were saved?" In you our ancestors put their trust; they trusted and you delivered them.5 To you they cried out and were saved; in you they trusted and were not put to shame. In another place, you suppose in one hand that Jesus was nailed to the cross and had his hands and feet been pierced ,on the other hand you said "Surely, Psalms 22 tell us that Jesus won't die, or were put to shame.."
1- Nothing from the verses ,nor other verses ,suggests that mere dying or being killed dishonor the prophets . Holy Quran 4:155 Because of their breaking the covenant, and of their rejecting the signs of Allah, and of their killing the Prophets unjustly. If mere killing wouldn't dishonor the prophets, so what shame Jesus was protected from ? â€œAnd if a man has committed a sin worthy of death, and he is put to death, and you hang him on a tree, his corpse shall not hang all night on the tree, but you shall surely bury him on the same day for he who is hanged is accursed of God...â€ (Dt. 21:22-23). If you want to make a point suggesting some similarities between his case and Jesus ,that shouldn't be called a prophecy fulfillment ... but a typology .. If you want to make a typology between David of the old testament and Jesus of the new testament , your typology would fail (they have hardly anything in common) . If you want to make a typology between the Quranic David and the Quranic Jesus , then again your typology would fail !! 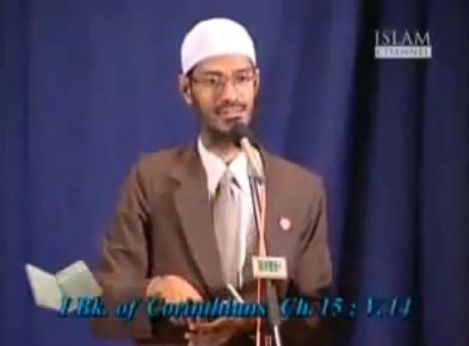 I have just uploaded a 3-hour debate between Dr. Zakir Naik and Pastor Rukni on "Was Jesus Christ Crucified?" but as a matter of fact ,I find a surprising description " Dr. Zakir Naik where he thoroughly demonstrated from the Bible's New Testament that Jesus Christ was never crucified, nor did he ever rise from the dead." with such description ,I guess I will have a critical word against Dr Naik's approach in that debate. Thanx again brother Osama ,for your never ending efforts. to put to DEATH by nailing or binding the hands and feet to a cross. Being nailed or pierced to the cross won't make you die! Nehemiah 9:26 Nevertheless, they were disobedient and rebelled against you and cast your law behind their back and killed your prophets, who had warned them in order to turn them back to you, and they committed great blasphemies. anyway though one being nailed or pierced to the cross won't necessarily make him die , there is a word that we can surely that man with. that he was "crucified"..
whether he died on the cross, escaped it etc.... that doesn't change the fact that he was crucified . If so ,then the swoon theory(that Jesus was crucified but later escaped the cross) which you believe in ,is clearly against the Quran. 4:157 He was neither killed nor crucified . Then my advice is that you revise again your believe that Jesus was put on the cross. In Arabic the verb "Salaba , crucify" does not denote automatically a death on a cross , but only hoisting or being hoisted up on a cross or plank or pole for the purpose of defamation and humiliation. Abu Nu`aym in Hilya al-Awliya' (1985 ed. 10:154=1997 ed. 10:161) narrates with his chain that when al-Daylami -- one of the early Sufis -- was captured by the Byzantines "he was crucified" (fa salabuh), and "when the Muslims saw him crucified (fa lamma ra'ahu al-Muslimuna masluban) they freed him after a raid and brought him down alive. He came down and asked for water, etc." Al-Tabari in his history Tarikh al-Muluk wa al-Umam (1987 ed. 5:414) in the chapter of the year 252 describes the events of `Abdan ibn al-Muwaffaq's demise: "He was crucified alive (fa suliba hayyan)... and was left crucified (turika masluban) until the midafternoon prayer. Then he was thrown into jail and remained there for two days. He died on the third. It was ordered that he be crucified again..."
There are also examples using the term salaba or crucify for defamation-displays taking place _after_ the death of the crucified, as alluded to in the Qur'anic sequence: "They never killed him, and they never crucified him." When Caesar's governor over Amman at the time of the Prophet -- Allah bless and greet him -- Farwa ibn `Amr al-Judhami declared his Islam, he was imprisoned until he died. After his death, he was crucified. Narrated by Ibn Sa`d, Tabaqat (7:435) May Allah be well-pleased with him, he believed in the Prophet -- Allah bless and greet him -- in the Prophet's time, yet never met him, like Uways al-Qarani. In the hadith of Salman al-Farisi about the corrupt episcopus of the Syrian church who died, then it was discovered that he had amassed a treasure out of the people's alms, Salman narrates: "They said we shall never bury him. Then they crucified him on a plank and stoned him." Narrated by Ibn Sa`d, Tabaqat (4:77), al-Khatib in Tarikh Baghdad (1:167) and Ibn Kathir in al-Bidaya wa al-Nihaya (2:311). In 231 Imam Ahmad ibn Nasr al-Khuza`i -- may Allah be well-pleased with him -- was decapitated in Samarra. "When his head was brought to the authorities [in Baghdad], they [literally] crucified it (salabuh)." Al-Khatib, Tarikh Baghdad (5:179). It is evident that the meaning here is "They displayed it on top of a pole." In 317 the caliph al-Muqtadir's chamberlain, Nazuk, was killed then crucified as stated by Ibn Kathir in al-Bidaya wa al-Nihaya (11:159 Dar al-Ma`arif ed. ): "They went to Nazuk and killed him while he was enebriated, then they crucified him" (thumma salabuh). So the focus in crucifixion is not on execution but on advertising defamation. In the above examples the maslub or crucified may or may not be dead but in the event he is dead, his death is immaterial to the definition or connotations of crucifixion. still I have a comment on the youtube videos ,later inshalah. Yes, Dr. Zakir Naik demonstrated very thoroughly from the NT that Christ never died on the cross. And he also never resurrected from the dead either. IN fact, he challenged Christians to show one verse where it says that Jesus Christ resurrected from the dead. Yes, that boldly. I know, it sounds surprising, but seriously, the brother did an awsome job demonstrating his points. May Allah Almighty bless you akhi. Yes, please watch the debate . 34And Jesus said, â€œFather, forgive them, for they know not what they do.â€ And they cast lots to divide his garments. Really? I believe that Jesus was on cross but didn't die. It doesn't really matter, if the word has two meanings. Jesus, surely didn't die.